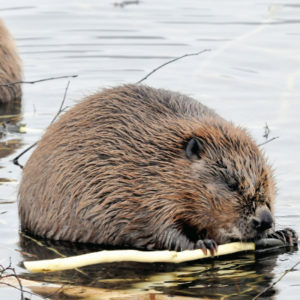 Beavers, North America’s largest rodents, have a complicated history with humans. These critters have largely been seen as a nuisance or a commodity, but river restoration specialists have begun to recognize the important role they play as architects of a watershed. Scientists and naturalists have long recognized that beavers create crucial habitat for hundreds of other species. Trout like to lurk in the cool, deep pools beaver dams create. Ducks take refuge in the ponds, away from hungry foxes and coyotes. Endangered boreal toads even rely on the East Vail beaver ponds for crucial breeding habitat. More recently, stream restoration specialists have begun to look to beavers for inspiration when trying to restore rivers and creeks to their natural states. Healthy waterways are messy. They meander, flood their banks, erode and carry woody debris and sediment to new places every year. While many people think of streams as static systems that should be contained in their channels, that is not how wild and healthy rivers behave. Complexity is one of the keys to a healthy stream. Rivers need space to move. That is why stream restoration specialists have begun to experiment with “Beaver Dam Analogs” or BDAs. These inexpensive structures often consist of little more than untreated wooden fence posts and woody debris from a stream itself. They mimic the ways beaver dams redirect streamflow and create pools, side channels and other stream features that spawning trout and the bugs they eat rely on. Sometimes, real beavers will even take advantage of the head start BDAs give them and begin to do the labor for us. Beavers are important to waterways like Gore Creek and the Eagle River, but how do we maintain ever-changing waterways and healthy beaver populations while protecting our trees and preventing our riverfront property and infrastructure from flooding? This takes compromise. Semi-urban stream channels cannot be allowed to meander with total freedom. Flooding waterways can destroy property and threaten lives. As riverbanks erode, property owners may worry that they are losing acreage of valuable land to the river. In a community like ours, waterways need to be given freedom to move where possible. In Vail, one of the best assets we have in restoring Gore Creek is Katsos Ranch, the natural open space between the East Vail highway exit and the Vail Golf Course. The area is characterized by healthy willows, pollutant-filtering wetlands and, of course, beavers. In this stretch, the stream channel has space to meander, erode its banks, flood and deposit sediment without risking human property or infrastructure. Brown trout breed here and aquatic bugs that fish and birds rely on cling to sticks and rocks, all the messy bits of a healthy waterway. While we may not be able to let Gore Creek flood, erode and wander freely everywhere in Vail, we are fortunate that some space was set aside for the stream to do all its messy business. We manage the creek where we have to by removing large logs that could damage bridge abutments (even though those logs would otherwise create hiding places for small trout) and by protecting streambanks from erosion where there is risk to property. However, where it is appropriate, we prefer to let the beavers and the creek operate with as much freedom as we can. Pete Wadden is the Watershed Education Coordinator for the Town of Vail and a former Graduate Fellow and Land Stewardship Coordinator at Walking Mountains Science Center. He can be reached at pwadden@vailgov.com.